There’s something delightfully old world and charming about a proper copper kettle. The warm-colored, shiny-textured aesthetic looks fantastic sitting in any kitchen. 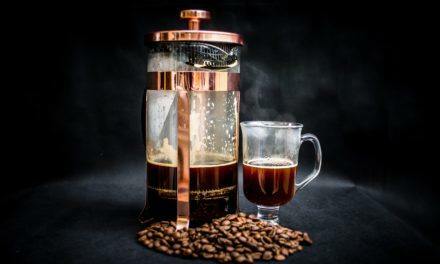 You may be a little wary of using a copper kettle due to health reasons, but we can assure you each product we review here is totally safe. After the reviews, we’ll get deeper into the safety issue to clear things up for you! We’ll also walk you through how to clean your copper kettle. You may be looking for the perfect gift for newlyweds or someone with a new home, and a copper kettle is a great idea. Even better, get one for yourself while you’re at it. 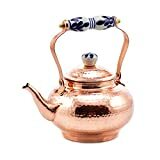 Without further ado, let’s find the best copper tea kettles! 5 Are copper tea kettles safe? This 1.6-quart copper kettle from Demmex is a real classic beauty. It has a hammered copper exterior and an ornate, carved spout in a contrasting gold tone. It has a large handle with a contoured, black grip and a stylish curved shape. It’s a stovetop kettle which you can safely use on gas or electric cooktops, but not for induction. This particular model has a high-shine, polished exterior, but there’s also a blackened copper style and an engraved copper style available too. All three options are incredibly attractive and perfect as a gift. 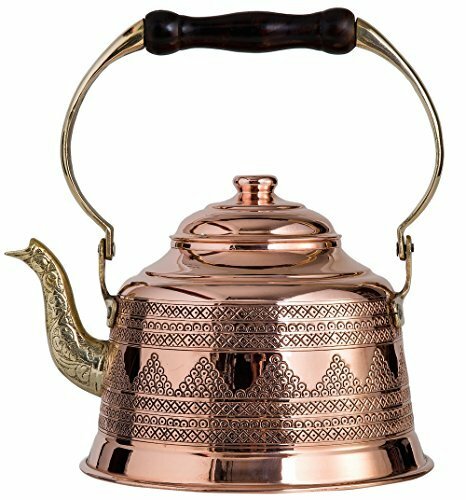 We love that these kettles are handmade in Turkey, made by artisans with special expertise for copper. These kettles are lined with lead-free tin for safe and non-toxic usage so you can boil your tea without worrying about copper exposure. It doesn’t whistle, just to let you know in case a whistling tea kettle is what you’re after! The price is incredibly decent considering the quality, style and handmade appeal of this kettle. Here we have a very affordable, sleek and modern-looking copper tea kettle from Lifetime Brands. This is a great choice for anyone who wants a tea kettle with that nostalgic whistle. It’s made of high-quality, safe stainless steel (the interior) and plated with a high-shine copper exterior. We love how this copper tea kettle is compatible with all cooktops, including induction (plus gas, electric and glass). It’s got a decent capacity too, at 2.5-quarts/2.3 liters, with a stainless steel lid to prettily offset the copper. The handle is perhaps not as dainty as the kettle above, but it’s got a certain cool, industrial feel. It’s all black, rather thick and creates a full curve from the back to the front of the kettle. The inside of the handle (where your fingers land) has a trigger which opens the whistle for when you need to pour. 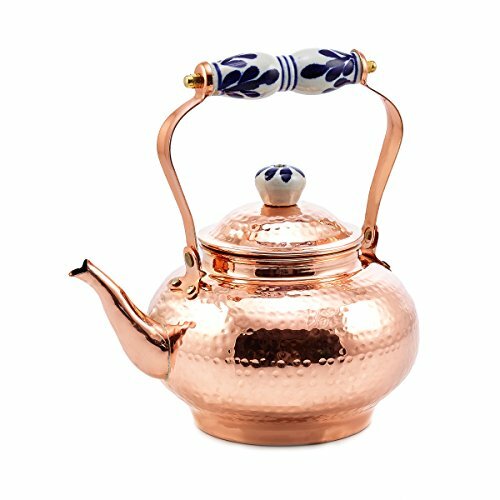 This stovetop copper tea kettle would really suit someone looking for something with a modern yet classically beautiful aesthetic. If you’ve got a small budget then definitely consider this kettle. This copper tea kettle has to take the cake when it comes to design features and overall beauty. A 2-quart capacity with a high-shine, hammered copper exterior and a classic, curved tea kettle shape. 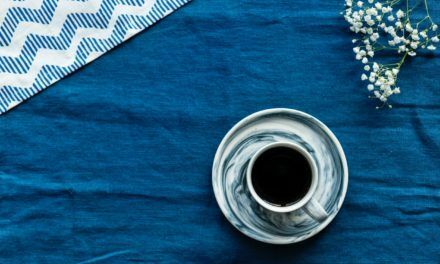 The prettiest part is probably the handle, which consists of two thin, curved sides with a blue and white hand-painted ceramic center. This is the kind of kitchen item which would be just as worthy of purchasing for decorative purposes as it is for practical purposes. You can use this kettle on gas and electric stoves, but it’s no good for induction cooktops. The construction is made from solid copper, with a nickel lining to keep the water from coming into contact with the copper. For the beauty, design and materials, the price is pretty incredible. An amazing gift for a stylish friend, or to bring a little lustrous life to your own home. This 2 Qt. Solid Copper kettle is so handsome, it'll be the focal point of your kitchen! Ensure your very own genuine Old Dutch product and buy from sellers Amazon or MMP Living; We're the real deal! Copper does tarnish and develop a dark, dull coating. To keep the smooth, lustrous appeal of shiny copper, you just have to regularly clean and buff it. Luckily, cleaning copper really just requires a few basic kitchen items. For example: slice a lemon in half, sprinkle some salt over the fleshy part and rub it over the tarnished copper. Rinse the copper with water, dry it, and give it a good polish with a dry cloth. You can do the same with a vinegar and salt mixture too. 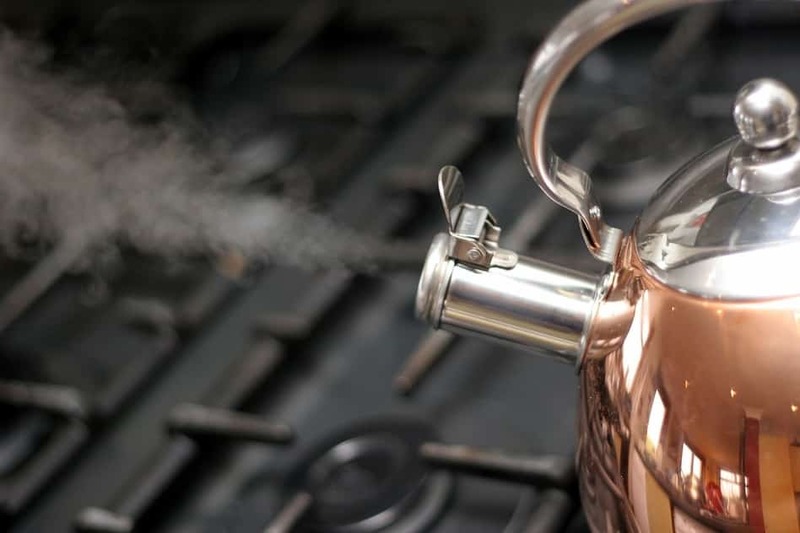 Are copper tea kettles safe? Yes…but…it depends on the construction and the age of the kettle. If you have a beautiful antique copper kettle sitting there as a hand-me-down from generations ago…I would leave it as purely decorative. This is because it’s likely not lined with another metal to keep the copper from coming into contact with your water or tea. Exposure to too much copper isn’t great and can lead to some unpleasant side effects. However, this isn’t anything to worry about as modern copper kettles (such as the ones reviewed above) are all lined with a non-reactive metal. The short answer? Yes. 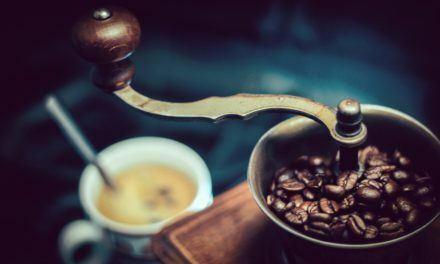 Copper kettles are safe as long as the interiors are lined with a non-reactive metal such as stainless steel or lead-free tin. Copper tea kettles make for a refreshing change from regular silver or plastic (i.e. electric) kettles. 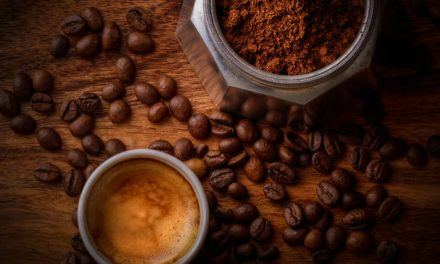 They bring interest, style and charisma to your kitchen, as well as conducting heat fantastically. Just remember to find one with a full lining to protect you from copper exposure, which is an easy feat as most modern copper kettles are lined. Have some lemons, vinegar and salt at the ready to keep your copper tea kettle shiny and new. The three kettles reviewed here are affordable, beautiful, safe to use and very practical.